Welcome to Bill's Used Parts, Inc. When you contact Bill's Used Parts, Inc. you can expect prompt service from our experienced sales staff that understands the automotive parts industry. Whether you are looking for foreign or domestic, car or truck parts we will deliver quality new and used parts in a timely fashion with a warranty you can depend on. We specialize in rebuilding front and rear differentials, manual transmissions and transfer cases. We have many units in the warehouse ready to go or we can build your unit for you. We are an authorized distributor for Dana Spicer and American Axle and will be glad to help you with your differential and drive line parts needs. 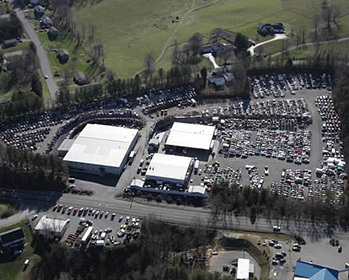 Bill's Used Parts, Inc. has been serving customers since 1944 had has over 60,000 square feet of warehouse space and operates on more than 13 acres of property. Eight different delivery routes are run to deliver to businesses, they range in frequency form every day to bi-weekly. Shipping is done daily via UPS and multiple freight carriers. Customer pickup is available with a loading dock and equipment with employees to help. Being a member of Team PRP gives us access to inventory from over 100 other recyclers to meet customer parts needs. Over 40 people are employed to provide prompt courteous service to our customers. Bill's Used Parts, Inc. has a URG 8000 Certification and is also a Certified Automotive Recycler by the Automotive Recyclers Association. These certifications require constant training, annual inspections, and maintaining an excellent customer satisfaction index. Bill's Used Parts Inc. is member of the Better Business Bureau with an A+ rating. Proper licenses and permits are obtained and maintained from the state and county that range from business to environmental. We burn used oil to heat the shop and warehouses. A closed loop wash water recycling system is used to clean parts. Every air conditioning system is properly evacuated. These commitments are made to preserve a green environment for everyone including future generations. Bill's Used Parts, Inc. is a proud member of Team PRP, a national network of over 100 independent parts distributors united in providing top quality replacement parts, exceptional warranties and personal service to the professional repairer. All Team PRP members are required to meet strict industry quality standards by achieving industry certification ensuring your receive the highest quality part available. All Team PRP members use ARA Damage Codes so you receive accurate descriptions and no surprises! All Team PRP members offer the best warranty in the industry, with unlimited mileage on mechanical parts and a lifetime warranty against corrosion perforation on sheet metal. All Team PRP members offer millions of quality parts through our combined inventories and 24-hour shipping.